Look What the Rains Brought! Those pink things you see are my first rain lilies of the season. Here in Dallas we had two days of heavy rains early last week, and look what they left behind. 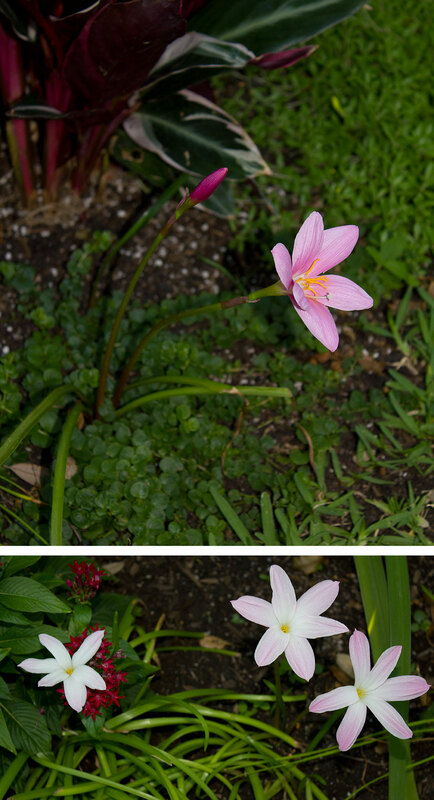 The one in the top photo is called Grandiflora Rain Lily (Zephyranthes grandiflora). It’s the biggest and pinkest one of the three varieties that I have planted. The bottom photo shows a variety called Habranthus Pink Rain Lily (Habranthus robustus). Both of these varieties and the third version that has yet to bloom were purchased through The Southern Bulb Company. The man behind The Southern Bulb Company, Chris Wiesinger (also know as The Bulb Hunter), has a great story on how he combined dating and bulb hunting into one event. Check it out.